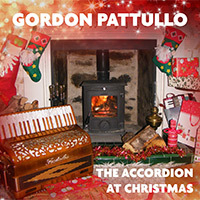 Watch a preview video of Gordon's latest album, "The Accordion at Christmas", below. 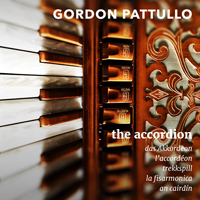 Watch a preview video of Gordon's latest album, "The Accordion", below. This CD is a collection of the most requested tunes from Gordon's repertoire as a soloist and with his band. With the exception of The Sands of Kuwait and The Furrows End all tracks are new recordings released on CD for the first time. The music reflects Gordon's work as a player and composer from being a wee lad in short trousers through to the present day. Featuring Gordon & his music with a host of Special Guests, musicians & scenery. Heavy Horses, Crook Making, Dry Stone Walling, Making Small pipes & Accordion repairs. Introduced by Bill Torrance. Duration 1hr 43 mins. PAL 16.9 All Zones. 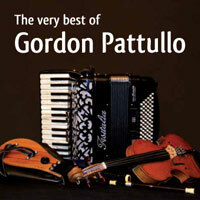 Gordon Pattullo, his Accordion and his Friends, Vol 2 is now on sale at £14.99 from this web site and all good music shops. Presented by Bill Torrance, and taking us on a musical journey with Gordon on accordion. Tributes to Andy Stewart, Sir Jimmy Shand & Will Starr are included. Special guests include: Freeland Barbour, Tom Alexander, Ian Powrie, Ian lees & Billy Anderson. As well as his solo playing Gordon also features in duets with John Crawford (piano), Angela MacEachern (fiddle), and his son Fraser on Low Whistle. 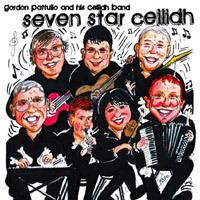 Gordon & his Ceilidh Band also play some of their favourite tunes. East & west coast scenery & farming scenes. Duration 78 mins. PAL 16:9. All Zones. Extra features included. 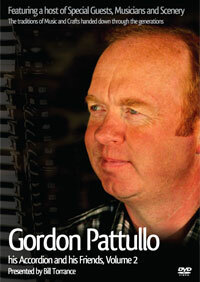 Gordon Pattullo, his Accordion and his Friends is now on sale at £14.99 from this web site and all good music shops.